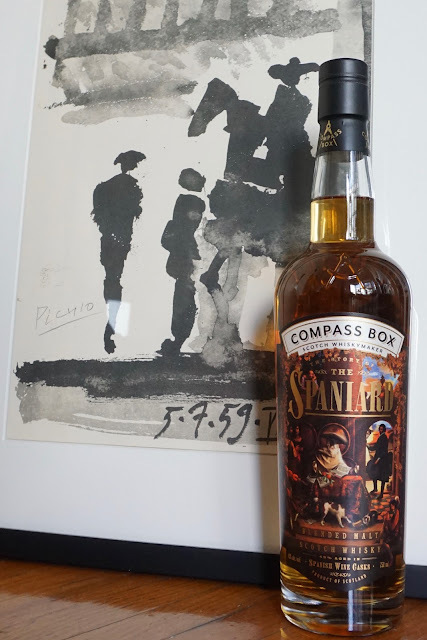 Compass Box The Story of the Spaniard (43.0%): The Story of the Spaniard is a new permanent addition to the Compass Box's portfolio. It is inspired by John Glaser's travels through Spain and by an earlier limited Compass Box bottling which Glaser created for a bar in NYC named The Spaniard. 48% percent of the whiskies went into the blend have been aged in first and second fill ex-sherry casks, 25% in ex-Spanish red wine casks and the rest in three other cask types of different sizes and char levels. The blend consists of whiskies from Teaninich, Deanston, Glen Elgin and from a distillery near Aberlour as well as a re-casked vat of whiskies from Clynelish, Teaninich and Dailuaine distilleries. Color: Yellow gold. Little hazy with very thin and faint legs. Palate: Nice surprise of faint smoke with the first sip. Char and toasted wood. It's dry and doughy... Cookie dough, dried strawberries and almond meal. Wine notes develop shortly after. Sweeter now... Raspberries, hibiscus tea and sweetened grape juice. Sour cherry juice, lollipops and skittles. Creamy with flan and fruit tart notes. Bitter almond cookies, marzipan. Loving the texture... It is thick, chewy and definitely luscious. Finish: Medium long with marzipan, vanilla and caramelized pears.